"I've seen the other side of many hills, but the horizon is as far away and as luring as ever." Eugene Gladstone O'Neill (1888-1953) is considered America's foremost playwright, responsible for bringing drama to the theatre. The son of a popular 19th-century actor, O'Neill spent his childhood touring with his father's theatre company, and his travels as a young man took him to Honduras, South America and South Africa. Upon returning to New York City, he was sent to a sanitarium when he developed tuberculosis. During his recovery, he turned his attention to writing plays, and would become a dramaticist for the Provincetown Players in Massachusetts and New York. His first long form play, Beyond The Horizon, originally presented on Broadway in 1918 and was heralded as the first true American tragedy. It earned him the first of four Pulitzer prizes in 1921, a first for an American writer. He would win a Nobel Prize for literature in 1936. The year is 1908. Robert Mayo (Richard Backus) is a dreamer, filled with ambition and a calling to explore the world; certainly not the type suited for life on his father's farm like his brother Andrew (Edward J. Moore). Robert was a student of literature and poetry, longing for what lies beyond the horizon. As the play opens, he is preparing for his journey out into that world, after securing a berth on his uncle's sailing ship. At daybreak he will be off for who knows how long, going where the fates will take him, in search of nothing but what he may come across in his travels. His older brother, on the other hand, is a farmer through and through, and his father has hopes he will marry the neighbor's daughter, Ruth (Maria Tucci) and expand their farm, carrying on the family tradition. However, destiny has other plans, as before he is to set sail, Robert confesses his love for Ruth, which she returns, and this causes him to have a change of heart, and stay on to marry her. His brother shares his affection for Ruth, and it is he that instead leaves for the world unknown, embittering his father for abandoning the farm. What follows is the story of their lives in three acts, and the consequences of their actions. 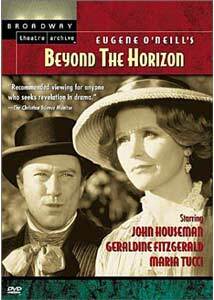 Beyond The Horizon is a made for TV dramatized adaptation of the play, staged by the McCarta Theatre Company of Princetown, New Jersey, and shot on location for the Theatre In America series, which brought a number of stage plays to screen utilizing the talents of theatre companies across the United States. The shooting style maintains a fairly static camera through each scene, capturing the performance with few cuts, and relying on the actors to provide their own blocking of the shots. This gives a more theatrical feel to the piece than many screen adaptations, which instead rely on an assembly of cuts and closeups used to build the narrative, and the acting style may seem foreign to those used to television drama. The cast work well together, with the principles, of whom only Maria Tucci is credited on the cover, delivering solid performances. Speaking of the cover, I have no idea where that image comes from, as it is not from this production. Those receiving top billing are actually in the supporting roles, with Geraldine Fitzgerald as Ruth Atkin's mother, John Randolph as Robert and Andrew's father, and James Broderick as their uncle. John Houseman makes an appearance as the doctor in one scene. This is a heart-wrenching story of regret, loss, betrayal and misunderstanding, and was certainly worth the viewing time. The production quality is consistent with 1970s TV, not overly elaborate, but suitable to the subject matter. The cinematography takes a back seat to the performances, though does utilize many location shots to establish atmosphere between scenes. The program is forwarded by a brief introduction to the Theatre In America series and the playhouse doing the presentation by Hal Holbrook, and Geraldine Fitzgerald follows with a more lengthy introduction to Eugene O'Neill, then provides an afterforeward with a reading of one of the writer's poems. Though looking somewhat dated, Beyond The Horizon is an interesting look at the first work from one of the most important playwrights in American history. Image Transfer Review: The transfer was made from a high definition master, however, as this was shot on videotape in the 1970s, it does reveal its age. The image tends to be murky and undefined on occasion, with a generally soft appearance typical of videotape. Defects are limited to horizontal dropouts, which are rare in the first two acts, but become fairly regular and abundant in the last act. Colors are for the most part well saturated, especially exterior shots, but interiors tend to be dark and slightly over contrasted. For its age, it isn't bad, but this could use some restoration, if that is even possible considering the source. Audio Transfer Review: Mono audio is acceptable, though does contain some location noise and hiss. There is no distortion present, nor any other major defects or imperfections. Fidelity is decent, and dialogue easily comprehensible. Extras Review: Select filmographies for Geraldine Fitzgerald, John Houseman and Richard Backus are included, which also include some of their theatrical credits. A collection of trailers from other discs in the Broadway Theatre Archive includes Working, Fifth Of July, King Lear, Antigone, Alice in Wonderland, Ah! Wilderness, Mourning Becomes Electra, The Royal Family, Hamlet, The Iceman Cometh, The Seagull, and The Time of Your LIfe. This section runs 53m:31s. As the first of Eugene O'Neill's full length plays, Beyond The Horizon marks a turning point in American theatre. This made for TV adaptation is acted by the McCarta Theatre Company, and delivers a fine performance of this groundbreaking work. While the quality of the source elements do show their age, it does not greatly interfere with the calibre of the theatrical acting, and the story is a great tragedy surrounding a pair of brothers and the woman who shared their love.